NASA rover "Opportunity" was laid to rest on Tuesday night as attempts to make contact with the long-lived, space explorer wrapped up. Eight months ago, a ferocious, fast-moving Martian dust storm is thought to have covered the solar panels on the rover and cutoff the vital supply of sunlight needed to power the device. NASA says the rover was designed to operate for only 3 months, but the rugged, over-engineered, robotic geologist kept sending data that led to amazing discoveries about Mars for nearly 15 years. It outlived its twin golf cart-sized rover named "Spirit" by 8 years. Since 2004, the rover has traveled a record 28 miles on the surface of the red planet and discovered "evidence that ancient Mars had water flowing on its surface and might have been capable of sustaining microbial life." Opportunity was exploring Mars' Perseverance Valley, fittingly, when the fiercest dust storm in decades hit and contact was lost. The storm was so intense that it darkened the sky for months, preventing sunlight from reaching the rover's solar panels. When the sky finally cleared, Opportunity remained silent, its internal clock possibly so scrambled that it no longer knew when to sleep or wake up to receive commands. Flight controllers sent more than 1,000 recovery commands, all in vain. NASA Administrator Jim Bridenstine said the overriding goal is to search for evidence of past or even present microbial life at Mars and find suitable locations to send astronauts, perhaps in the 2030s. "While it is sad that we move from one mission to the next, it's really all part of one big objective," he said. Colonel Sanders, c3k, GoldenTiger and 7 others like this. Slow, respectful clap. Well done. Well done. Edit: Now how will Mark Watney call home?!?! ArFLaserBear, steakman1971, tesfaye and 11 others like this. Darunion, tesfaye, Monkey34 and 7 others like this. MavericK, GoldenTiger, jtm55 and 4 others like this. Congrats, you gave more than expected. jtm55 and lostin3d like this. Once we land some humans I'm sure a good dusting and a jump start will be all it needs to explore the next crater. next-Jin, jtm55, lostin3d and 1 other person like this. I wonder if the solar panels are so covered in dust now that they aren't able to produce any electricity to power it anymore. Nevermind, it's one of the first sentences. That's what I get for skipping to the middle. FreeLow, Algrim, tesfaye and 10 others like this. Like was once said in the initial naming contest: "Thank you for the 'Spirit' and 'Opportunity'." lostin3d and AceGoober like this. I like your title better. Can't change it due to indexing. But many props to you! pfc_m_drake, lostin3d and AceGoober like this. 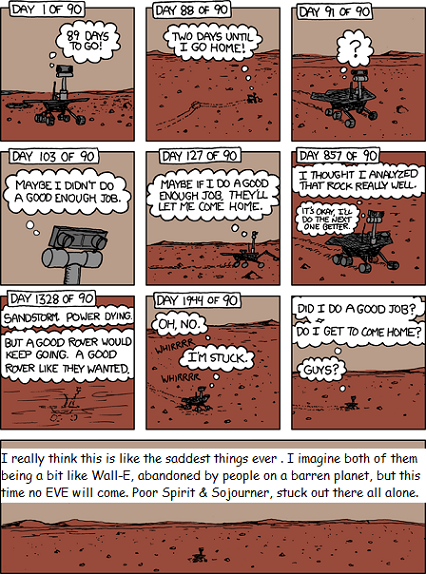 Someday people will visit Opportunity just like they visit Mount Rushmore or Old Faithful. Opportunity will be sitting in a domed display on Mars with an attached museum about Mars and human exploration. There will be a coffee shop, a gift shop, and a solarium. Hopefully they will power her up again so she can take pictures of tourists as they take pictures of her. I'll be dead. But I like to look to that future. Carbon_Rod, Monkey34, GoldenTiger and 2 others like this. That thing is an absolute marvel of engineering. PaulP, lostin3d and AceGoober like this. GoldenTiger, lostin3d and AceGoober like this. That's assuming we are still using the same radio protocols when we finally get there. I'm also guessing they would have to replace the batteries as they would no longer hold a charge no matter how functional the solar panels were. Fortunately, the Twins big brother rover, Curiosity, runs off a nuclear radioisotope thermoelectric generator. That thing will likely wear out it's wheels before the power goes out. Trigger, Carbon_Rod, tesfaye and 3 others like this. Go forward another 1000 years and a dude who looks a lot like that ancient aliens dude will be saying on a Martian tv screen "what was this stone ring used for... this rock henge ? Was it aliens... or perhaps our ancient ancestors marking where they made contact ?" Hopefully one day we do return to clean off Opportunity and Spirits panels... I bet Opp fires right back up ready to send data home. NASA really knocked this mission out of the park... sleep well boys. I wonder what brand of batteries were used in Opportunity, 15 years is amazing. RIP for now, Opportunity. Now that's some bang for your buck. Hats off to the engineers. 2x 15lb Li-ion (containing eight prismatic, 10 Ah cells) made by Yardney Technical, recharged by solar arrays with triple-junction GaInP/GaAs/Ge cells. Nanogrip and GoldenTiger like this. RIP lil Oppy. You and Spirit have done well. joobjoob and Krenum like this. The 2009 stimulus was 700 Billion. Nyt economist wanted double or triple that amount. Iraq war estimates are also around 700 Billion. National debt is now 20 trillion. Future unfunded liabilities exceed GDP of entire world at 100 trillion. For comparison these rover missions are about 2 Billion. My point being, much like late stage rome, our empire is broke and headed for histories dust heap sooner or later, but these .01% spending will be our notable contributions to the future they actually remember us positively for. So sad that the Telemetry data has been lost and we will only get weak CGI. Given how well this design has worked out, I have often wonder why NASA hasn't sent more of them with improved science equipment. Could likely build several of this design for each of the larger nuclear powered Curiosity design. Be cool if the weight was light enough to use a Falcon 9. I wonder if the fact it lasted this long was because some engineer noticed that NASA gave them more of a weight budget than expected? A good wind storm in just the right direction will clear the solar pannel Nd suddenly it will respond again. I don’t consider this mission “over” just paused for awhile. Because there is only one reasonable launch opportunity (due to planetary alignment between Earth and Mars) every two years or so. And these things are expensive to build, launch, and monitor. NASA has only so much money in it's budget every year and even then it can't use it all on planetary exploration missions. Also remember that the rovers depend on orbiters to relay data, and those orbiters need to be replaced regularly too. steakman1971, seanreisk, Krenum and 1 other person like this. One day V’Ger will return to collect her children spirit and opportunity.